On International Primate Day, 1st September, (founded by ADI) we revealed primate suffering and exploitation at Schwaben Park in Germany. 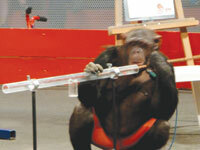 ADI witnessed first-hand how chimpanzees were turned into figures of derision during the park’s twice-daily shows. These intelligent, emotional creatures were made to ride a tricycle, balance on a ball and jump over hurdles whilst chained and collared. Chimpanzees naturally live in complex societies but when used in entertainment they suffer terribly, with infants torn from their mothers, spending their lives enduring social isolation and deprived conditions. ADI has called on Schwaben Park and launched an online campaign urging the Park to end these shows and retire the chimpanzees. Please help – email: info@schwabenpark.de – today. Click here to donate now and help us end the use of animals in entertainment.